Here is the poster from the upcoming film THE PLACE BEYOND THE PINES . The movie is directed by Derek Cianfrance, starring Ryan Gosling, Bradley Cooper, Eva Mendes, Rose Byrne, Mahershala Ali, Emory Cohen, Dane DeHaan, Gabe Fazio, Bruce Greenwood, Ray Liotta, Ben Mendelsohn, Harris Yulin. THE PLACE BEYOND THE PINES Opens in theaters March 29, 2013. 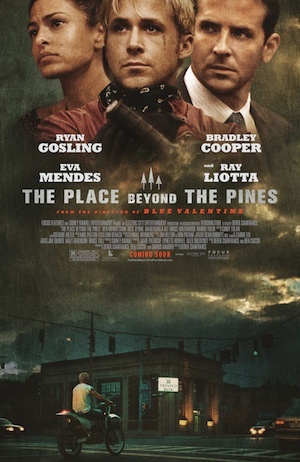 Here is the trailer from the upcoming film THE PLACE BEYOND THE PINES . The movie is directed by Derek Cianfrance, starring Ryan Gosling, Bradley Cooper, Eva Mendes, Rose Byrne, Mahershala Ali, Emory Cohen, Dane DeHaan, Gabe Fazio, Bruce Greenwood, Ray Liotta, Ben Mendelsohn, Harris Yulin.